This is the time of year when we start to harvest the beginnings of our wonderful soil conditioner – leaf mould. As the autumn colours arrive so does the inevitable fall of leaves from the trees. Many of these end up in the rivers especially after heavy rainfall having been washed off paths and roads into the waterways. As we have 10ml screening at the end of our leat we collect a massive amount of leaves each autumn. We are about three quarters of the way through the fall of leaves this year with most ash, cherry, beech and hazel trees already bare. Another couple of good frosts will see most of the remaining leaves fall, mostly oak. We pile up the leaves and let them rot down over the next year. 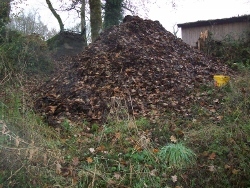 Next September we turn the pile of partially rotted leaves just before we start collecting again. After two years of composting down we have the most wonderful leaf mould soil conditioner which benefits our farm fields. Natural recycling at its best!